Theme which is based on Burlap Christmas Decoration is hot for giving the rustic look. It certainly can complement so many decorating styles, this simple fabric is showing up everywhere from do-it-yourself projects to chic home stores. Christmas decorating is certainly no exception. A quick perusal of Christmas decor ideas on internet will turn up a treasure trove of burlap items. One of the simplest ways to create burlap themed decoration is on the dining table. A simple length of fabric can serve as a runner to anchor your centerpiece and add attraction. You can take it to the next level by weaving together 2 colors of burlap. Yes, you can buy colored burlap and explore the wide range of decoration possibilities. You can design layered burlap placemats over red plaid for a nice textural contrast. One can demonstrate with their outdoor tablescape, this look could easily be tweaked to work for any season or holiday. If you’re interested in a little splash of burlap in the living room, you can try customized burlap. The source for so much handmade loveliness is having several cute options for Christmas and winter. Little burlap on the front door looks fantastic. There are many different styles of burlap wreaths, to suit any taste. Make it attractive with types of embellishment. You can wrap the burlap around a form and added ribbon medallion flowers. You can use the strips of burlap and create a ruffled look. Or you can weave a wire hanger through a long strip of burlap; you can’t get much thriftier than that! You can attach the fabric rosettes with pins instead of glue, so that they easily can be switched out for different accent pieces in another season. There are some adorable Christmas trees, made using burlap and other materials. Once again, the unique texture is what makes this fabric really stand out. If you add some metal stars, it will give the trees a more rustic look. Combination of burlap and canvas fabrics for a clean, crisp wintry design looks good for the ruffled tree and the one covered with rosettes. If you aren’t able to find colored burlap, you can spray-paint it any color you want. Burlap will dull your good fabric scissors, so use an old or inexpensive pair. Burlap is not only an amazing fabric but it is also very simple and rustic from the first glance. It can be used to give very elegant and refined look to the Holiday decor. I think it is a wonderful material to use for Christmas decor. It beautifully creates warm and cozy feel much needed for the festive season. Let’s have a look at some very creative and beautiful Christmas decor inspirations made of burlap. It’s amazing to make the Christmas stocking from Burlap to decorate hallway, staircases or walls. It is made from pure organic linen burlap fabric. Stocking is fully lined with white cotton. Hanging is made from linen ribbon. You can decorate the Stocking with satin ribbon and wood buttons like red, olive green, moss green, cream white, silver gray ribbon and three tree, one heart, star, rocking horse, car, train, bone shape wood buttons. 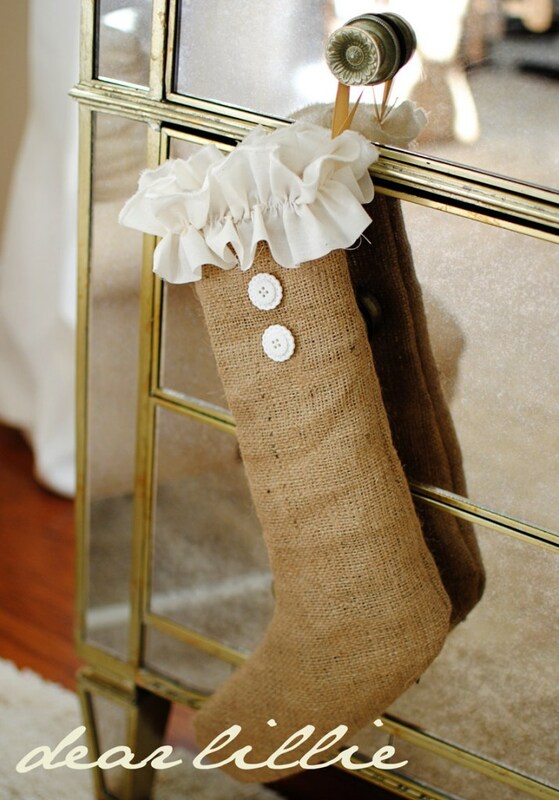 You can add some style to your Christmas with handmade burlap stockings. These stockings are perfect for all sizes of gifts and give a great look to your house whether you just like burlap or going for a rustic look. This burlap Christmas wreath is wonderful Christmas decor for this season. You can create a matching or personalized chevron burlap bow. All edges of the burlap are sewn by Burlap Blooms to insure a quality wreath that will not fray and last year to year. The back of the wreath will come felted. You can create cute burlap wreaths with few bows and pallet Christmas tree saying. Your DIY wreath has the perfect touch of rustic country feel. This will give all your guests a warm country welcome. You can have a nice addition to any holiday tree or overall home decor by creating a DIY burlap Snowman Craft. It is an ideal primitive display in your living room or to create a wreath of having a snowman in the middle. Snowman can be e ready to hang with a loop of matching embroidery thread through the top of the floppy hat. You can also select to include a finished doll stand to turn him into a free-standing peg doll. Stands are painted dark brown and stained to coordinate with the clothespin legs. Using Burlap to DIY the Christmas decoration is brilliant idea due to its cost effectiveness and easy availability of burlap material. It looks very elegant and can be matched with rustic Christmas decor theme by making burlap stockings for the decor. You can create cozy fleece stocking with burlap cuff and bow or Linen stocking with fleece cuff and burlap bow. You can also use Woven textured stocking with burlap cuff and buttons. Not everybody enjoys burlap as much as I do. And at times, even for me it can be overkill. This beautifully hand crafted Jingle Bells pillow would look lovely in your living room. Make a great gift for family or friends. It is made with a colorful burlap fabric and you can add a customized jingle on it. this is embellished with hand painted letters that can read Jingle Bells or anything you like you can DIY. You can add a tan burlap ribbon and red bells on the sides of the pillow. You can create a beautiful burlap wreath ornament to decorate your Christmas Mantel, Christmas tree or staircase, wreath, Christmas table, living room, outdoors etc. Create a beautiful grapevine wreath and add burlap ornament on it. Also create a simple burlap wreath and use it as an ornament to decorate your Christmas tree. It is perfect for any holiday. Lights may be added if wanted. Great novelty bags can be made for Christmas gifting. It’s fun to take to the game of this DIY project, beach or just to collect. This craft makes a great gift bag for wine, candy, bath salts, bath soaps, etc. It is also a great Bridesmaid’s gifts. Give as a gift or use as a table decoration for Christmas, Wedding or any other festival. These fun and rustic, natural burlap bags make perfect party favor bags for showers, weddings, birthdays, receptions and other events. It is one of the traditions to DIY Christmas wreaths with Jingle bells. Your burlap wreath can be made with a light natural color. From the center, you can hang a candy cane made from jingle bells. This will be sure to make your guests smile as they enter your home this season. This festive holiday wreath uses combinations of swirl. You can use holly berry ribbon throughout the wreath and features colorful jingle bells dangling from the center. This Burlap Roses wreath is the most beautiful part of your home decor. Elegant, rustic-style wreath made with lace burlap and faux flowers/leaves can be done as a DIY project for Christmas decor. This wreath makes for bright, beautiful year-round home decor for any room. You can hang it in your living room, dining room, bedroom, bathroom, sun room, or on your front door. It’s just perfect for the holiday season and all places. It’s amazing to create a DIY Burlap lighted garland. This garland has multiple uses for your holiday decor. You can create a DIY lighted garland that features seasonal, neutral color up cycled, tri-colours, chocolate brown, cream, and coffee color burlap, jute, warm energy saving holiday light strand, and wire. This garland will look absolutely best with tablescapes, porchscapes, manstlescapes, holiday trees, displays, door and archways, and the like. Snowman inclusion in home decor is very popular during the Christmas. It brings unique joy and cheer to have different types of snowman decor in your home. These adorable snowmen can be created for your rustic home Christmas! These magical snowmen are crafted from foam balls using burlap and twine. They are adorned with primitive check fabric scarves and buttons. Their hats are made of felt and trimmed. It’s the time of Christmas and all of us would be busy decorating our Christmas tree. You can easily make the DIY project of Table Christmas tree. All you require is a Rustic look for your home decor. You can use Handmade Gold-Edged Burlap Ribbon, White Lace, White and Silver Wire-Edged Knotted Ribbon Christmas Tree Decoration with Wooden Trunk, set in a Wooden Block with Decorative Ink-Stamped Snowflakes on four sides. Christmas is coming fast and you need to get something for hall decoration. Including the burlap snowman and a rustic theme would be perfect. It is impressively large and would be so easily seen from your front door. You can create a Snowman made out of burlap to match our overall theme. This scarecrow stake would make a cute decor for your fall front porch. Scarecrow is on a wood stake and base and holds a cute little crow. Candles and candle stands are very important part of the festival decor. And we can further make it look more beautiful by wrapping the candle holders with burlap and some lace. These beautiful golden burlap tea candles are covered in creamy and tea-dyed lace over golden burlap. They accent each other so beautifully. If you want all or just a few of the designs, you may customize. Vintage lace does not last forever. These adorable votive candle holders would look great in any home. They are decorated with burlap and lace ribbons and tied off with twine and an adorable silver plated sparrow charm. These candle holders are suitable for tea lights or votives during the Christmas. You can also create burlap and lace wraps for a Mason jar candle holder. On this jar you’ll find lace, burlap and twine. You can add a light iridescent paint to the jar before you put the lace on to give it a rich glow when it’s lit. Table runner has its unique importance in every household throughout the year. But when it comes to the time of Christmas, it is really interesting to create a DIY table runner for your dining table. These burlap and lace table runners can be customized. They are made of natural and biodegradable burlap material with floral off white lace in the middle. You can sew the edges properly so that there is no fraying. You can create a handmade table runner by just adding top quality floral lace. Some luxury table runners are made of natural linen – Handmade linen table runner with hemstitch will decorate your dinning or holiday table. Natural linen is very durable as any other linen goods. Natural materials and colors make us feel comfortable and grounded. The home represents your heart and is a manifestation of our beliefs. Such natural burlap table runner is perfect for your dining table.